Of course, the first thing you’ll do is write your introduction. I did a full training on how to write your introduction in episode 18, so start there. Once your introduction is written, you’ll go through these 5 steps to add emotion to it so you don’t sound like a robot. For our example, we’ll use the following introduction for a fictional character, Erika Johnson. As a 4-sport athlete and valedictorian, I sure know how to juggle. I even got a scholarship to the circus, well, for basketball. I’m contestant number 4, Miss Carlton, Erika Johnson. Now, I know what you’re thinking. This is easy! I don’t have to listen to this episode, I can do that too. But, let me tell you how many times I’ve worked with women who when they are reading something are excellent, and then get them under the lights with 40,000 other things on their mind, sweaty arm pits, and barely any sleep – it’s not easy. 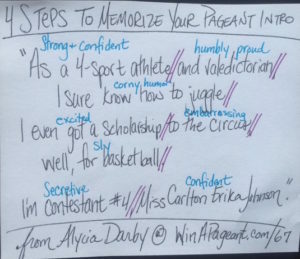 Trust me when I say, you need to do this exercise, especially if you are in a competitive pageant. Before you begin: Get out your introduction and print it out double-spaced. I did this on a piece of paper for you to see how I do it. Step 1: Segment out each phrase of emotions. The way I do this is with a backslash between segments. In our example the segments are: As a 4-sport athlete — and valedictorian — I sure know how to juggle. — I even got a scholarship — to the circus, — well — for basketball.– I’m contestant number 4, — Miss Carlton, — Erika Johnson. When I do this for my clients, I segment it into as many segments as possible without coming off schizophrenic. You don’t want to have every word carry a different emotion or the audience will be on such a wild ride they’ll be too confused. Instead, you want to tell a story with your emotions, so don’t go overboard. Usually where there is punctuation like a comma or period a new emotion can be relayed. Step 2: Now, go through each phrase and identify the specific emotion you want to infuse into each segment. For example, the first segment as a 4-sport athlete I want to sound strong and confident. For and valedictorian I want that to sound humbly proud. The I sure know how to juggle could be corny humor. I even got a scholarship is exciting to the circus is embarrassing, well, for basketball is sly. I’m contestant number 4 is secretive and Miss Carlton, Erika Johnson is confident. Step 3: Now that you have an idea of how you want each phrase to sound practice them individually. Confident: Miss Carlton, Erika Johnson. Step 4: Now, start from the beginning and say the first phrase with the second until you’ve nailed the transition. Continue adding a segment at a time until you continue nailing it with emotion. Do this step while looking at your paper. Eventually, you’ll be able to remember your own vocal tone with the words until you can say the whole thing ta-da! It’s really that simple! This is the method actors use to memorize lines and public speakers use to memorize speeches. It’s a simple way to memorize your speech without making it sound monotone.